Hereford Cattle in New Zealand. “Active Female” - a female whose Inventory fee has been paid. as defined later in these regulations. “Conception” - the moment the embryo is created. “Depasture” - the process of naturally mating a sire with females. “Donor Dam” - a dam which has produced an embryo. “Frame Score” - height of cattle, determined by reference to an approved chart. been removed from “Active Female’ status by its registered owner. the country of origin on the registration certificate of the animal. financial member of the NZMHBG. “Natural Service” - the natural joining of a sire to a dam. 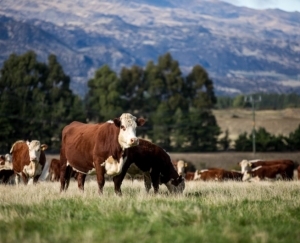 “NZHA” – New Zealand Hereford Association. “NZMHBG” – New Zealand Miniature Hereford Breeders Group. animal in the NZHA records. “Possession” - refers to an owner who has physical possession of an animal. “Prefix” - the name of a stud as registered with the NZHA. “PTIC” - pregnancy tested in calf. “Registered” - denotes that an animal has been registered in the NZHA Herd Book. shall carry the prefix of the registering owner. Technique of Tattooing set out in the NZHA Herd Book. with the calf ear tags and/or tattoo to indicate the year in which a calf was born. 1. NZHA Membership fees are set out in the Herd Book. 2. NZMHBG Membership fees are $50.00 per stud per annum. 3. 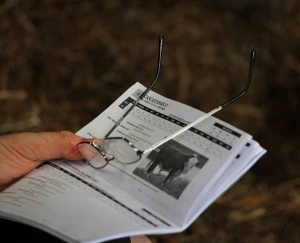 Registration fees are in accordance with the NZHA schedule of fees as set out in the Herd Book. NZHA in accordance with the NZHA and the NZMHBG Regulations. Veterinarian may take the measurement. Certificate of Registration noting the two year frame score measurement. age and still be considered Miniature. will calculate Frame Score from the measurement. 1. Grading up is only permissible for polling purposes in accordance with NZHA Regulations clause 10a. 2. Members must apply to the NZMHBG Executive Committee for approval. 3. Foundation stock (male or female) must be fully registrable with the NZHA and at least one of the parents must be polled. 4. If the animal is registered in Australia with the AMHCA and acceptable to the NZHA and the NZMHBG it can be used in the program. 5. A manual calf entry form with both the parent's verified DNA is to be attached and sent to NZMHBG registrar for approval. 6. Once approved by NZMHBG, data is to be supplied to the NZHA for recording on the computer system. 8. When the offspring reach generation 5 (G5) they will be registerable as a miniature Hereford. 9. The registration papers will show a P for polled. 10. Polled offspring, G1, G2 etc may be sold and transferred for future breeding in Grading up Program but cannot be registered as miniature Herefords or regular Herefords.